Currently in its sixth year, TEDxUniversityofGlasgow is a local, self-organised branch of TED at our own University of Glasgow. Every year a new team of students is chosen who then, per tradition, works hard throughout the year to organise both salons and a final main conference. This year’s conference will focus on the theme, ‘Wrong Way – Go Ahead’, which, in their own words, will be ‘telling histories of exclusion and the refusal to comply with the norm and how these can lead to greatness.’ Ahead of this main conference, which is being held on March 2nd, the team held their annual launch party at the GUU, a night filled with creativity, positivity, sharing, and community. As iterated by the host at the start of the night, TED is all about ‘sharing ideas that are worth spreading’, and this principle was certainly at the heart of the whole evening. Opening with an entirely improvised performance from the GU Contemporary Musicians United society, the GUU Debates Chamber felt full to the brim of imagination and collaboration; after searching the audience for suggestions, the band landed upon the theme of ‘ideas’ to centre their final song around, truly epitomising the collaborative, idea-driven night introduced in the host’s opening words. 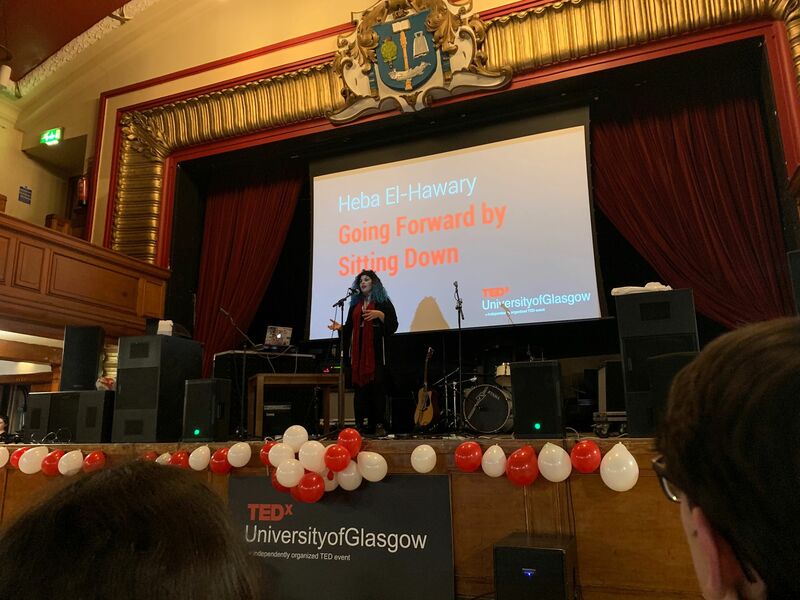 Following on from this awe-inspiring improvised performance, Heba El-Hawary took to the stage to deliver the main talk of the night: ‘Going Forward by Sitting Down’: her personal tale of overcoming mental health issues through mindfulness and meditation. El-Hawary frankly allowed the audience a glimpse into her ‘non-linear journey’ to happiness, insisting that we must first look inwards at ourselves if we are ever going to move forward. With every single body in the room captivated by her story, El-Hawary’s talk culminated in her powerful and personal realisation: do not cry the tears you were meant to cry months ago, cry the ones you need to cry now. With these words lingering in the air long after El-Hawary left the stage, the night continued with a mixed dance display from Dancemania, a juggling-comedy act from Ellie Moore, performances from Glaswegian band The Rain Experiment and DJ Calum Matheson, and a recorded 2016 TED talk from Tim Urban entitled ‘Inside the Mind of a Master Procrastinator’. Breaks between performances also allowed us to make our way around the interactive stalls in the room, including a space to release some anger with the Muay Thai Society, a photobooth, as well as information on the work of HelpingHands, the GU smart prosthetics society. All of this amalgamated to create a night bursting with life, ‘ideas’, and collaboration; if the upcoming main conference is anything akin to the launch party, we are certainly in for a treat. The TEDxUniversityofGlasgow 2019 Main Conference is being held on Saturday 2nd March from 9am to 6pm. Tickets can be purchased here.